How can I import files and folders into DraftCode? How can I rename/copy/delete/zip files or folders? Do you support external keyboards? How can I export my files? How is the runtime different from apache? What is the path to my workspace? Can I configure 'Run' to start with a specific file? Which PHP extensions are included? Can you help me understand how to use WordPress, configure phpMyAdmin, etc? I love DraftCode, how can I help keep it going? Choosing "Open in..." from other Apps to "Open in DraftCode"
Using the document picker inside DraftCode to select a file on one of your locations like iCloud, Dropbox etc. By using the Apple "Files" App. Select a folder you want to copy to DraftCode, tap "move" and then navigate to DraftCode's workspace under "On My iPad" to copy the folder to the desired location. If you want to import a folder from a location that only supports files, we recommend to zip compress your folder, import it, and expand it in DraftCode using the built-in zip/unzip support. You can perform various tasks on files or folders by swiping the file or folder you want to modify. Please note that as usual, the available keyboard shortcuts are shown when holding the Command key for a few seconds. If you want to use GIT with your PHP projects, we recommend to use Apps like WorkingCopy in conjunction with DraftCode. To hand a new version of a whole folder back to WorkingCopy, zip it first and then "Open in..." the zip file in WorkingCopy. WorkingCopy will then guide you through how the changes will be imported into the repository. You can hand any file or folder in the workspace over to another iOS App or use an Extensions via the standard share button available when swiping right on a file or folder in the file navigation column on the left. This way you can upload to iCloud Drive, DropBox or the FTP App of your choice. If a destination app does not support folders, simply zip your folder first by swiping left and choosing "zip." and then send the zip file. If you use WorkingCopy, you can hand over a zip to it and the App will guide you through how the changes should be imported into the repository. What is the phpMyAdmin database password? It is the password of your external database. MySQL is supported in the sense that the MySQL PHP extension is included, but a MySQL database itself is not (and cannot be) included. For offline database work we strongly recommend to investigate using SQLite3, which is included and does not require an external database server. It is a great SQL database and if your App uses PDO you might be able to simply switch over. The included WordPress package for example runs completely offline using a WordPress SQLite plugin. 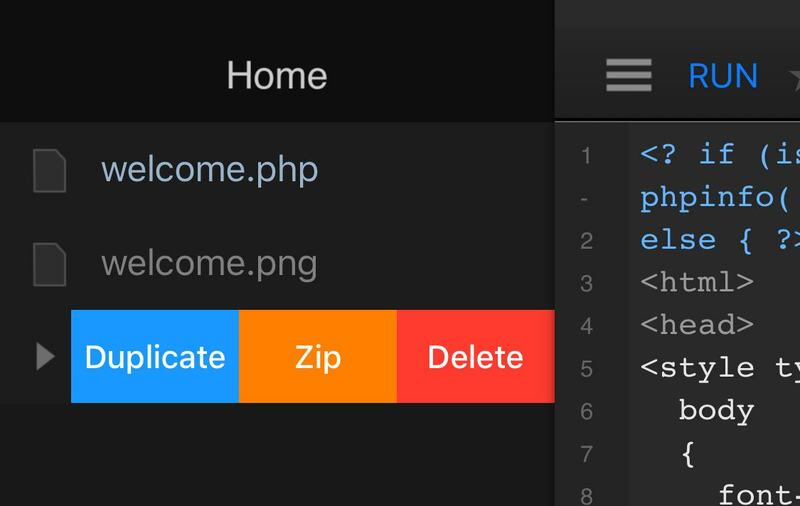 From the perspective of your PHP App running inside DraftCode there is no difference or limitation. Please note that you however can NOT access the runtime from other iOS Apps or other devices on the local network, and that rewrite rules are not currently supported. The path is different on every installation because the workspace is part of the App's sandboxed folder. You can use __FILE__, __DIR__ and similar PHP variables to get to the absolute path of your installation, or alternatively use relative paths. Yes. 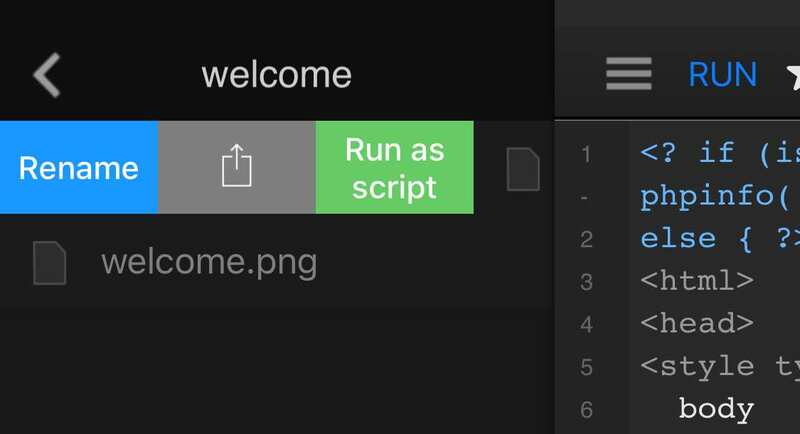 You can use the "star" button in the code editor to mark a file as the starting point for when you hit "RUN" instead of the file you are editing right now. This is useful for larger PHP projects with many files that you might work on but that are not a valid point of execution. Here is DraftCode's PHP 5 phpinfo output and PHP 7 phpinfo output which shows all currently included extensions. Compiling PHP for iOS is a non trivial task and certain extensions pose significant challenges. It's unfortunately not as simple as "just including them all". Please get in touch if you need an extension to be supported. It helps us to prioritise what to work on next. The PHP Apps that are included in DraftCode are identical to their versions you can download from the web, include the same documentation and behave exactly like on any other PHP installation. We have tested them to ensure they work as expected. Please understand that explaining how to configure phpMyAdmin, or how to work with WordPress is not in scope of DraftCode support. Please have a look at the documentation or online forums of these Apps for more information. Thank you for your understanding. The AppStore is a challenging place for niche Apps like DraftCode. Please help spread the word and rate/review every new version of DraftCode. It really helps! And if you find an issue or are angry about something, please get in touch with us before deciding to write a bad review.